Looking for some exciting adrenaline fuelled racing for your event? 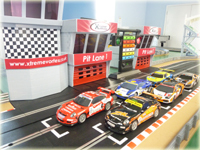 Look no further than our amazing Giant Scalextric slot car circuit hire. Our six car race track is digitally controlled and we can display all your qualifying and lap times in real time on our race screen. 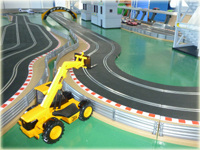 Our Scalextric track is so diverse and we can operate a real variety of races. We can provide the activity for a ‘have a go’ race or for a more complex race, compiling of qualifying and then a race duration. We can even add in compulsory fuel stops to make things realistic and really exciting. Our Scalextric track is exciting with twists and turns and a cross over point, we even have overtaking points and a pit lane, so you really do get a realistic racing experience! Choose your moment to outwit your opponents and go for track position on the crossover overtaking points located around the track. Racing with Scalextric has never been so exciting! The Giant Scalextric is great for a variety of events from conferences, car show room promotions, product promotion, charity race nights, product launches, team building events, school fetes and even wedding entertainment. With the game software we use, we can change the dynamics of your race to suit your event. You may be looking for a quick race or you may be looking for a more complex scenario such as endurance races . We can provide a variety of options for your races to make things very exciting such as limit the amount of ‘fuel’ you have so you must take pit stops. Due to the variety of options that are available that we can set for your event race, this makes our Scalextric perfect for an assortment of events. Whether you are looking for people to have a quick race or are looking to provide team challenge with the activity we have a solution which will be perfect for your event. Let us know what you are trying to achieve and we can provide the best race format for you. We can provide a variety of cars so if you have a themes event we can suit your theme. Maybe you have a James Bond theme night and would like all the cars to super cars such as Aston Martin’s to fit in with your theme, or maybe you are promoting a car at your car show room and want a car that is the same as your brand. We can provide different race cars for your event, please discuss car options with us and we will try to meet your requirements. Our track has been cleverly design as we always want to provide you with the best. Our track can incorporate your company branding on parts of the circuit which make it perfect for product launches, team building events and promotional event is car show rooms. The activity must be used in a covered environment and a power supply is required. If your event is an outdoor event we can provide a gazebo for the scalextric.